Did you know that Google turned 14 last week? yes, its hard to believe that Google is still only in its teens. Especially when you think about how much they have grown in that short space of time. 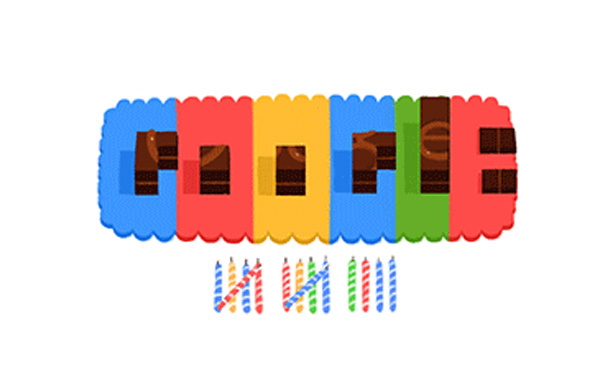 Google’s birth date is the subject of some controversy in the nerd world. According to some accounts, the company was created on Sept. 4; but in the last couple of years, Google itself has been celebrating its birthday on Sept. 27, which landed on a Thursday this year. Since 2002, Google has been celebrating with special birthday doodles. This years doodle is an obvious one: an animated cake with 14 candles for you to “blow” out. here are a few of the infamous doodles from over the years..
All together now… Happy Birthday to you, happy birthda… ok ill stop. Whilst your here, check out a previous blog I wrote about some of the nerdy things google have treated us to here. Enjoy!